I blogged about this fibre a few posts back and now it is all spun up. I spun the yarn quite finely with a lot of twist as I chain plied it. You can really see the separate colours in this view. I produced a decent 235 yard/ 207 m skein, 114g. 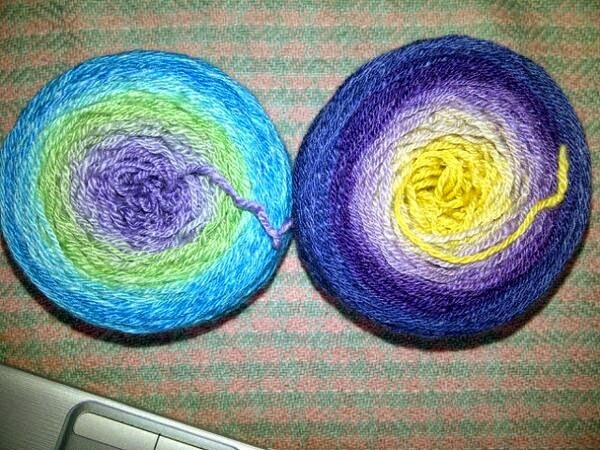 And here it is wound into a ball sitting next to another ombre inspired yarn I made during Spinzilla in October. The silk in these yarns really comes through. Now I’m looking for a project. Thinking about a long shawl/scarf that would show off the colour gradations. What do you think? This entry was posted in handspun yarn, navajo plying, ombre, Sweet Georgia Yarns on April 5, 2014 by DianaTwiss.